Post subject: anyone else fly rc planes? I used to fly years ago. Then got into nitro trucks. Then tried helis..... dodnt go to well. Just got a tiny traxxas heli that i do pretty well with. Nice aircraft you have there. Now, Which one of you are a better pilot? I have one almost ready to fly in a Box. I gave it to my Father in law for Christmas like 5 years ago. only dabbled in cheap rc planes a bit, always been into cars though. 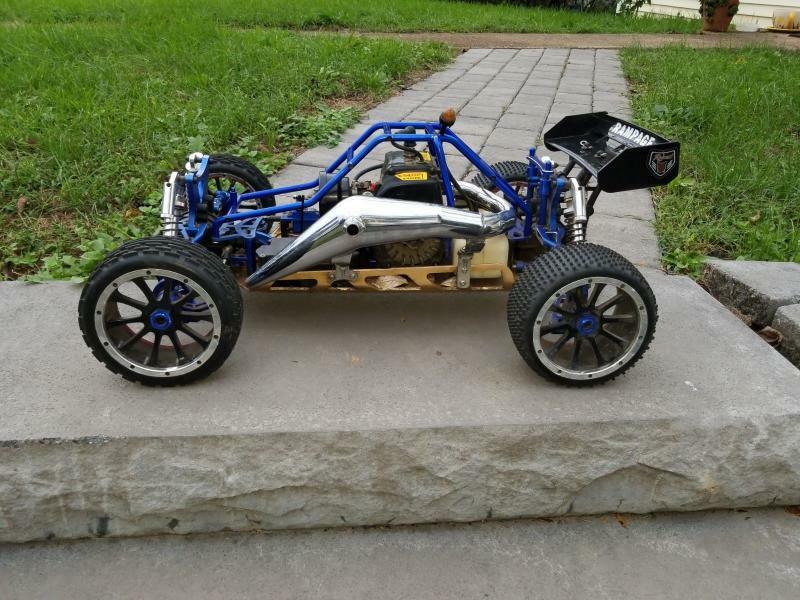 I have an old nitro 2.5 tmaxx the 2.5 blew some time ago I putt a 3.3 engine in it's fun but that 3.3 was almost a mistake the shorter 2.5 chassis is really squirley and a wheely machine with the 3.3. Also have a brushless rustler, both are fun need to get them out. Seems everytime I have them out something gets broken last time was the tmaxx having fun on some gravel piles a rear knuckle went out. I've often debated one of the cheap rc fishing boats figuring that would combine two fun hobbies. I've got a workshop full of model airplanes. Haven't touched them in years. I keep thinking "I'll get back into it". But, what with boats and fishing and some golf, I never have time. Someday, maybe. I've never flown an RC plane but it is appealing. I would probably enjoy building the planes more than flying them. When I was a kid we flew planes in a circle on control strings. I remember the Cox 049 engine with this kind of spring windup thing to kick the prop around to get it started. The airplane was a "trainer", meaning the wings were held on with rubber bands so when you crashed you could put it back together. That way you could keep on going until you got so dizzy you puked. Yep, them were the days. You guys just remember; Gravity gets real unforgiving of mistakes. I used to fly them. its not as hard as you would think. but stay away from heli's..... i just got back into the RC game a month or so ago. i kinda got the itch for another nitro truck. then the day i bought a used one my DREAM RC buggy popped up on FB messenger. since i was a kid i wanted a 1/5 scale 4wd truck or buggy. but they cost is astronomical. i made a super low ball offer and they took it...... just the exhuast system would have cost me more than what i paid for everything plus a big tool box of spares and tools. this thing has a 30cc weedeater engine and is about 3' long. I've always wanted to give a 1/5 scale a shot, but I imagine I'd break stuff on it just as often, and parts cost more it seems. But something sure is cool about having essentially a hopped up weed eater engine zipping a little care around 40+ mph. I have one of those control line planes myself.